A car can be spotless from the outside but the interior is the main essence of a car. A dirty interior is not only an eyesore but also makes people sceptical of sitting in your car. The common questions that go through everybody’s mind are how to clean car interior myself? Products to clean the interiors? How to clean the dashboard and seats? Here we give you the best products and ways on how to clean your car interior. Cleaning seats could be a tough job but not when you the know the exact products to use. Although, there are a number of products available out in the market but the need for both seats is different. a) For fabric seats, you can go for Formula 1 Dry Clean Carpet & Upholstery Cleaner. b) For leather seats, you can try Formula 1 Mr.Leather Spray Cleaner and Conditioner. In both cases, spray the products on a cloth and wipe off the seats. A vacuum cleaner is a blessing to get rid of all the dust accumulated over time in your car. If you want to know which vacuum cleaner is best for your car, you can read our expert review here. All you have to do is empty your car, take out the floor mats and vacuum thoroughly. You can either vacuum the mats to remove dust or wash them with some water and washing detergent if they are really filthy. Use products that can maintain a shine on your dashboard and prevent dust from settling in. These products come in a spray bottle and provide a glossy finish to the interiors and prevent dust particles from staying there. Many big brands like formula one and 3M have products which fulfil this purpose. The 3M Auto specialty Dashboard dresser is one of the best products available in the market and is being sold at a low cost of Rs 274. For cleaning your car windows you can go for Formula 1 Glass Cleaner with Rain Repellant. Spray the product directly on the window and with a gentle motion wipe it off with a cloth. 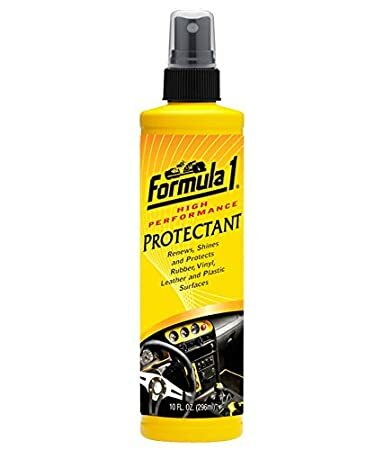 The Formula one protectant is another product which is being used commonly nowadays. This product is popular because it can clean any surface – be it rubber, leather or plastic. Another factor that makes it amazing is the sweet fragrance that it radiates long after it has been used. Every car has that piece of dirty cloth that is the solution to every spill, patch or dirt. That cloth serves multiple purpose without being cleaned or replaced. Cleaning the windscreen, wiping dew of the side mirrors, cleaning pigeon poop – you name it and this rag can clean almost anything. But this dirty rag cannot clean plastic, cannot clean beverage spills and is ineffective towards leather. Microfiber cloth is a better substitute of the “rag” and serves the same function. Why not Hire a Professional to do the job? If you are unable to keep your car super clean and your help is not really helpful, then hire a professional to do the job for you. There are many car spas that have opened up in Delhi NCR that provide car cleaning services. If your car is really dirty and you want to get it cleaned from experts at the comfort of your home, do check out Broomberg Car Cleaning Services.